You may still be able to book by calling the hotel at 410-528-1234. 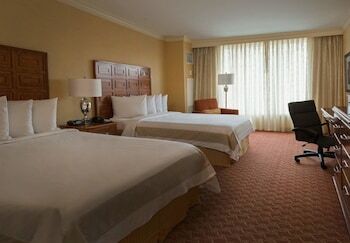 The Hyatt Regency Baltimore is your passport to all the sights, sounds and excitement of beautiful Ravenstown. 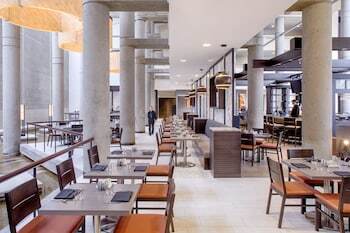 Perfectly situated on Baltimore’s Inner Harbor -- the go-to destination for upscale shopping, dining and entertainment in the city -- you’ll find a well-appointed hotel that boasts a thoroughly contemporary style in each of its 488 spacious guest rooms. Regal colors lend every room an intimate yet stylish atmosphere, as you kick back on plush armchairs and cozy chaise lounges, while a gorgeous marble bathroom accented with blue accents and multi-colored tile reflect the hotel’s waterfront locale. Modern amenities, such as a 32-inch flatscreen TV, broadband Wi-Fi and an iHome stereo with iPod docking station help you to feel at home as you rest easy on the Hyatt’s signature Grand Bed, with its sumptuous duvet and down pillows. It’s safe to say the only trouble you’ll have while staying here is deciding when to leave. Hyatt Regency Baltimore Inner Harbor is a 4-star hotel located at 300 Light Street, Baltimore, MD 21202, US . Its nightly price usually falls between $99 per night and $419 per night, excluding tax, depending on room category. $99 per night found for a Guest Room, 1 King Bed room type. Hyatt Regency Baltimore Inner Harbor sells rooms through sites like Room 77, Expedia, Hotels.com, GetARoom, and many others. Room 77 searches across dozens of different sites to find the lowest discount rates available. The lowest rate we've seen over the last few weeks was found on Room 77. In 1% of the cases we surveyed, all sites offered the same rate. You can compare real-time rates from all of these sites on Room 77. Room 77 is the only hotel shopping site that includes special discounts like AAA, senior, government, military, and corporate rates.